In my post on setting a grocery budget, I mentioned that I use very few paper towels, and I got a question from a reader who was wondering how to keep towels and dishcloths sanitary. He also wondered if this creates a lot of laundry. My family and I haven’t experienced any negative health problems despite the rampant dishcloth/kitchen towel usage at our house, so I feel quite sure what we are doing is safe. Bu then again, there are some important things that I do to keep our kitchen linens from getting disgusting. So, I thought I’d share them here because I feel like paper towels are one of the easiest disposable paper products to avoid. 1. Never let towels/dishcloths stay wet. Hang them up somewhere to let them dry overnight. A balled-up wet dishrag sitting by your faucet is going to become a bacteria factory overnight and it will have the smell to prove it. And never, ever put a wet towel into a pile of laundry on your laundry room floor or into your hamper. Always let them dry thoroughly first, unless you’re washing them right that minute. 2. Never use towels/washcloths more than one day. Every single morning, I throw yesterday’s dry towels and washcloths into the laundry room, where they wait for the next load of laundry they can join. 3. Always use a fresh towel to dry clean dishes. 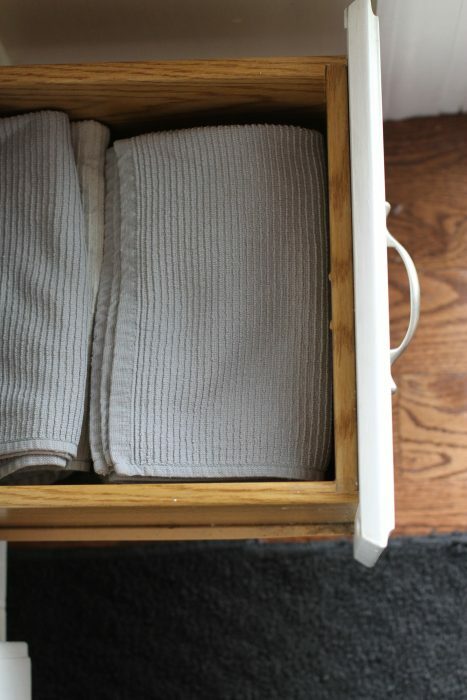 Towels used for other purposes won’t be completely clean, and you’d like to keep your freshly-washed dishes clean! 4. If your towels/dishcloths touch raw meat, don’t use them again until they’re washed. This can cause cross-contamination, so don’t use them for anything else until you’ve washed and dried them. Rinse them, hang them and let them dry, and then wash them. Or wash them right away, if you happen to be doing laundry. 5. Use the dryer or the sunshine. I don’t use the hot water cycle when I’m washing towels; the reading I’ve done has said that a half hour of high heat in the dryer is much more effective at killing viruses and such than hot water is, as most homes do not have water hot enough to actually kill germs. Another option is to dry your towels and dishcloths in the sunlight, but of course, that’s not a helpful tip on a cloudy day! 6. Boil your dishcloths/towels occasionally. 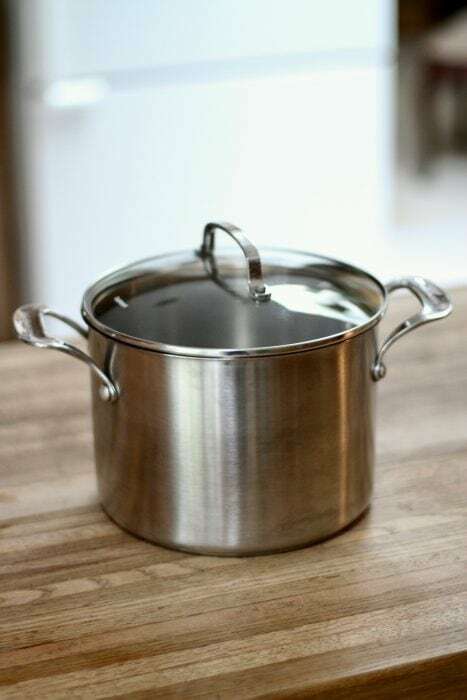 A ten minute bath in boiling water on your stove top (here’s a post I wrote about that) will sanitize them and remove any stubborn odors. This is particularly helpful for dishcloths, which are more prone to smelly funk than towels, in my experience. 7. Wash them with bleach or vinegar. I don’t love using bleach, but if you need a little extra reassurance that your kitchen linens are clean, you can occasionally add some bleach when you wash them. This will discolor items that aren’t white, though, so be forewarned. I much prefer to use the boiling method mentioned above! Also: I haven’t tried it myself, but another option is to add a cup of white vinegar to the rinse cycle. Vinegar is safe enough to use every time you wash.
8. Use paper towels sometimes. If you need to soak up grease, paper towels are your friend. And if you need to blot moisture off of raw meat before cooking, paper towels are perfect for the job. 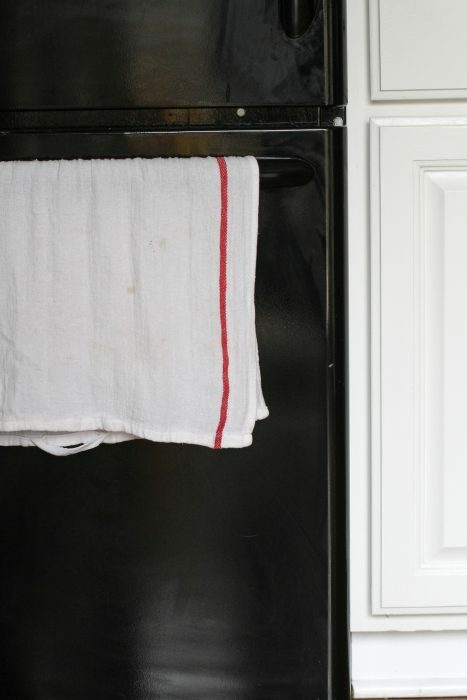 You don’t need to be all-or-nothing when it comes to paper towels, and using paper towels for these especially greasy/germy purposes will help to keep your reusable kitchen linens in better shape. A little side note: People often ask me if kitchen towels/dishcloths create a lot of laundry, and honestly, I don’t feel like they do. I just put the (dried overnight) linens on my laundry room floor and then throw them into the washing machine when I do the next light-colored load. The laundry effort required really is minimal. 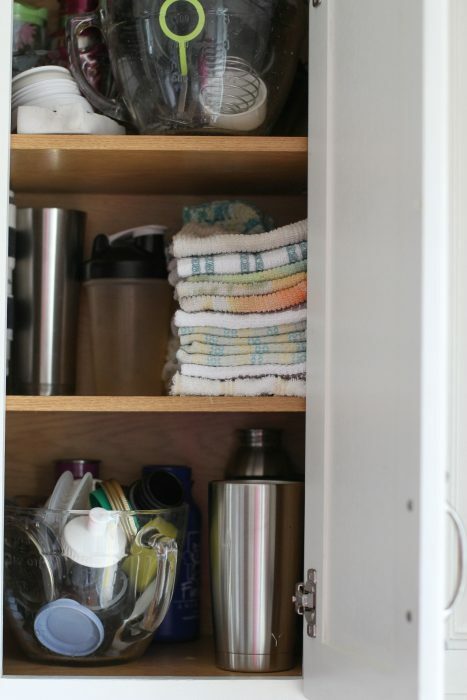 Fellow fans of kitchen linens, I’d love to hear your tips for keeping yours clean and safe! P.S. Need some kitchen linens to get started? I have these organic 100% cotton dishcloths, which have held up very well for me. These non-organic ones are more affordable but still 100% cotton. I like Ikea’s super cheap $0.79 tea towels (white with the red stripe in the photos above). For a fuzzier towel option, these terry ones are very absorbent, although sometimes the stitching on mine comes loose. The gray towels in the photo are these ones, which are rather pricey (the set of six is a much better deal than the set of two, however!). They do hold up well, they come in tons of colors, and they will pay for themselves when used in place of paper towels. We’ve been using cloth rags and towels now for…I guess nearly 20 years, that’s about as long as we’ve been married. Cloth napkins, too. Strangely enough, it was the cloth napkins that made my mother-in-law doubt my sanity; she was convinced that would lead to “too much laundry”. She was so worried she once bought us a whole pack of paper napkins when she visited! We only used them when she and my father in law came over. Don’t use a dish towel to dry your hands on–it’s not sanitary. I keep a terrycloth hand towel in the kitchen for hand drying. I also keep a lighter colored, lighter weight, dish towel out for dishes or pans that I want to dry by hand. It’s a good idea to make them look different from each other so people won’t get confused about which is which. It helps to remind those using the kitchen that paper towels aren’t free. I have gotten kitchen towels, flour sack towels and even bath towels at Sam’s Club. They are affordable, good quality and last a long time. I am sure the same is true for Costco. I use rags all the times. It saves so much waste. We do keep paper towels on hand but only use a roll every 3-4 months. If it is something super nasty I use an old cut up rag that gets tossed. I use brown paper bags for bacon grease and friend foods. I add the rags to my regular laundry so I don’t think it adds much. We turn old dishcloths and clothes into rags and use them for disgusting jobs. Then we throw them away, no washing. 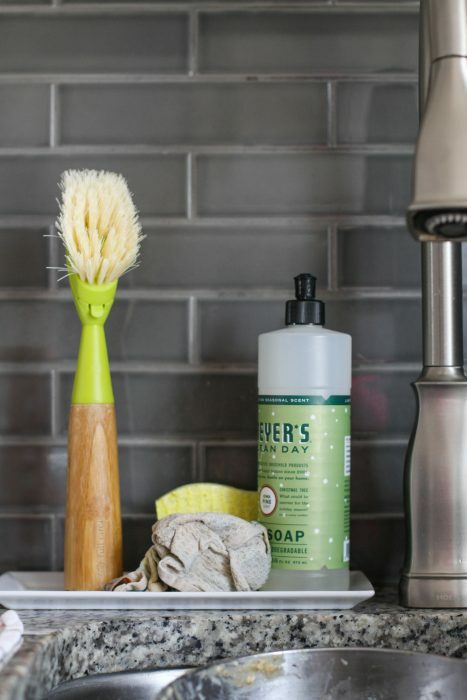 We also use dish clothes instead of paper towels and use vinegar with every load to be sure they get really clean—there is no odor after the washing. We have had the paper towel roll for over a year and it is not even half used. Hubby likes to have them around. I never use them. He does. He got a roll for Christmas. The kids couldn’t stop laughing. Using cloth napkins has DRASTICALLY reduced my paper towel usage. I’ve easily cut the amount of paper towels we used by 2/3…..but…..where we struggle is “to go” sandwiches in the morning. We wrap them in a paper towel and eat them that way on the way to work. Any suggestions on how to break this habit? I think I’m too close to the problem to see the way out – haha! I don’t think I have enough cloth napkins to use those but maybe I can try….other thoughts? Try bees wax wraps (you can make them — see the internet — or buy them, there are several brands), the reusable lunch bags (Reusies is one brand but there are others), or a few dedicated napkins, pieces of muslin, or cut up old sheets for that matter. I’ve seen people wrap them in bandannas, which are cheap, too. I was given a couple of holiday patterned zip-loc bags full of cookies a couple of Christmases ago. I washed the bags, cut off the zip-loc part and use these bags as a to-go sandwich wrap/holder. I just pop the sandwich inside with some of it poking out of the top. If the sandwich is small I fold the bag around it. I wash the bags when I do the dishes and hand them to dry overnight. The two bags have lasted a year–so far. I do this as well. If the paper towel is clean or mostly clean (say, just a bit of melted cheese), I use it again for the next sandwich. Darlene, the zip-loc idea is neat. I’ll try it next time the zip-doodad breaks on a bag. When my family switched to using cloth napkins several years ago, my mom was so generous and made us over a dozen napkins from soft fabric scraps she already had on hand. These can go anywhere, including on the go with sandwiches. Just bring them back home after work and reuse/throw in laundry. Personally, I would not be devastated if one gets lost in the shuffle now and again because they were simply scraps of fabric. I have others that are nicer sets and we use them with at home meals. We have drastically reduced our paper napkin usage!! I keep a pack in the house for larger cookout type parties or a larger group of kids/pizza type gatherings, but that’s about it. At a thriftshop, I got a nice set of cotton napkins for next to nothing. I use those on the go. They were nice enough to feel like a luxury, but I would not mind terribly if I lost one. It feels very neat sitting on the train, getting out your lunch box, thermos and napkin and having a bite! We do this too! I have several larger cloth napkins that I’ll tie into a sack and can fit 2 apples and some small Cutie oranges in. We take these along in the car often. You call also use a bandana. Plastic boxes. We have so many it is hard to find storage for them. All kinds of things come in them so it is not necessary to buy them! I would get or make more cloth napkins. I find it helpful to have a lot of lot on hand. It really helps with paper towel replacement. They are easy to sew up or I grab them on clearance at stores (i am not picky and they aren’t matchy. And when you use them everyday they are going to be stained anyway) or I always find cheap piles of like new napkins at yard sales. I would go with napkins or cut fabric scraps. You can get rid of some old shirts you should has gotten rid of years sgo. If they are mostly clean when you are done eating, you can give your dashboard and cupholders a quick wipe before leaving the car. This has been such a great response! Thank you so much for your ideas, I’ve enjoyed reading them and will find one that works best for us. Thanks, Kristin (forgive my spelling if incorrect) for this article! Most helpful and interesting! I use dish rags as well for majority of our cleaning. I will use paper towels for meat messes, toilets and pet accidents. I have make a roll of paper towels last 3-4 weeks. – To destain clothes, you can also use TSP (trisodium phosphate). My expert suggests soaking stained fabric in hot water + TSP. – You can microwave dish clothes to clean them. It does the same thing that boiling does (essentially they boil in the microwave), and softens any muck in the microwave as well. I nuke my kitchen sponge and dish cloth every day or two. – I use dish clothes for more than a day, no ill effects in my household. Perhaps because I nuke them every day or two. A’course the rules change for immunocompromised folk. – I put wet dish clothes in the laundry but spread them out on top so they dry. I don’t buy paper towels anymore, but my husband still gets a roll now and then. I use leftover paper napkins from co-workers who get lunches to go and leave their unused napkins in the break room for anyone to use, but mostly, I use really worn out, but clean, rags for greasy or “nasty” messes, then throw them out. I use the nicer cloths for everyday use — wiping counters, wiping out sinks, for hand washing and drying, etc. I wash the cloths once a week in hot water, and use the dryer or the sun on them. I also use an enzyme cleaner and vinegar when I wash them. If the cloth I’m using hasn’t touched anything like meat or nastiness and I have a load about to go in, I’ll toss that one in with that load as soon as I finish using it. I change them regularly and let them air dry after use. Yes to having a dedicated hand towel along with the dish-drying towel. 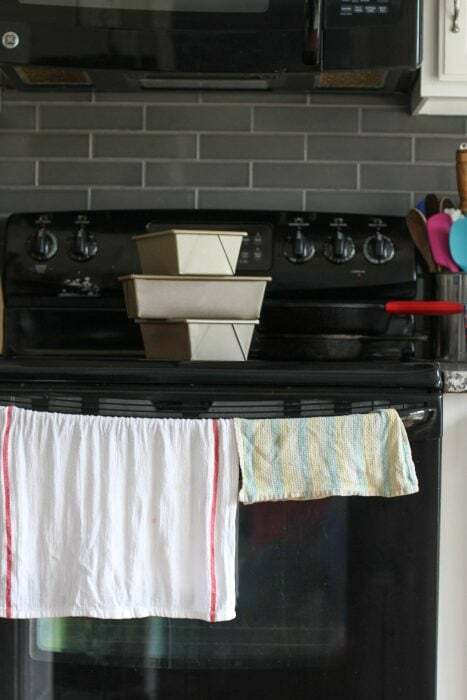 My towels are obviously different — I use regular, plain bathroom style hand towels in the kitchen for drying hands, whereas my dish towels have the colorful kitchen patterns on them, and it seems to keep people from confusing them quite well. My dear late aunt used to visit us once a year. She would go through two rolls of paper towels in a week, and I’m not exaggerating. I always bought a big pack when I knew she was coming. For example, I watched one day as she cut up a piece of fruit on a paper towel on the counter, put another on the table under her drink glass, another one under her plate as a place mat and one on her lap (I had clean cloth napkins out for her to use). When she finished eating, she wiped off the table with a fresh paper towel then she threw all the towels in my trash. We have to carry off our own trash, and she increased it noticeably every time she visited. The funny thing is, she was of the generation that grew up without paper towels. You’d have thought that using cloth would have been more natural to her. I think your Aunt probably remembered all the ironing associated with cloth towels and napkins and thought of paper towels as a huge time and energy saver! Terry towels were not common in the “olden days”. Linen or woven cotton towels, with pretty embroidery, were used and they were ironed (which sanitizes) after washing. My husband is always complaining–somewhat jokingly, but not really–about not having paper napkins or using paper towels, because I don’t keep the first and rarely use the second. I have a big bowl of cloth napkins on the table and a large stash of old cloth diapers–the all-cotton kind–that I use for spills and things. Like you, they just go in with regular laundry. I do laundry almost every day, so they get washed very frequently. I put my dishcloth and scrubby thing in either the dishwasher or the microwave every night. The proofreader in me is also laughing, but compelled to correct, my own comment. I should have written, “Like you, I put them in the regular laundry,” as I did not intend to imply that I would throw you in the laundry. I can add my endorsement for using vinegar in the rinse cycle for getting out odors and such. It also works as a fabric softener because it gets out all the detergent, and makes everything smell clean! Don’t use fabric softener on towels as it makes them less absorbent. I use terry cloth towels for hands, and linen for drying dishes. The linen towels, often with lovely embroidery, come from thrift stores and usually cost less than $1. They are soft and absorbent, lint free, and my favorite. When our five children were home I often put a label above each towel designating their use. I called it my silent training method. I buy the cheap washcloths at Walmart they sell 12 for about$3. I buy the dark colors and they last a long time. The Ikea Teklas are fantastic. Somehow I end up ruining at least one inbetween Ikea trips so at least they are cheap enough to replace. When I do need paper towels I find that 90% of the time I’m okay with using the free newspapers which are constantly showing up at my house every week. My washer has a sanitize cycle which gets the water really hot so I don’t have to boil them or do anything like that. My method is very similar to yours except for I do not boil mine. I use a bit of bleach occasionally if things get really grungy. I use vinegar to clean with often so I think that is the main reason my rags/towels rarely smell. I also rarely use paper towels. My system is similar to yours. I would only add that I use more disposables if someone is sick to quell the spreading of germs. Some will argue that’s not necessary but it makes me feel better and it’s a rare occurrence anyway. As an alternative to paper towels and napkins, Mrs. Frugal Asian Finance mentioned on her blog, they use toilet paper. It’s a clean roll designation just fir that use. We’ve adapted that. It is so cost effective & gets the job doe. We put it on our paper towel dispenser. It’s very cost efficient & gets the job done well. When we want to hide our/my frugality if we are having new, new guests, we put it under the sink & bring out the paper napkins. Othewise, whomever visits regularly, this is who we are & how we roll…..lol. Sorry about the bad job on proofing my comment before posting. Although I still use some paper towels, we are a very heavy dish towel family. I agree with everything you said. I buy all white dish cloths and towels so I can bleach them. I start with a new dish cloth and towel every day. I dry the wet icky ones in our garage (which is usually hot). I also also hang them…in our case, I hang them over the recycle bottle/can bins in our garage. I do use vinegar in every rinse cycle. It definitely helps with smelly teenage clothes as well as dish cloths. We have a ton of small, handmade, hemmed pieces of cloth to use for wiping up spills, cleaning kid’s faces, as napkins, cleaning counters, etc. With my first child I also used these as wipes. Same idea as a piece paper towel. Since they are small it’s easy to just throw the dirty one in the wash and grab another. I just wash them with our regular wash and have never noticed they smell bad. Dish sponges probably carry more germs than wet rags. We use cloth towels etc in kitchen, but sometimes need to use paper. It is possible to use a lot less than many people do. If I am cleaning up a cat throw up I’ll tear the paper towel in halves or quarters. And use as much as necessary. For a babies mouth with a little bit of spit a quarter of a towel is plenty. My son-in-law would pull off 5 or 6 whole towels to wipe his babies mouth!! We use paper napkins when we have guests for dinner. Usually they are virtually unused so any that look clean we put aside for floor clean ups. Spilled water or food or cat throw up – we have two cats. Just to add to what has already been said, I use vinegar in the rinse cycle of all my laundry. It’s a great alternative for those of us who are allergic to fabric softener. It helps get the soap residue out of your laundry. Also, an alternative to harsh bleach is non-chlorine bleach. You can use this on any colored item without worrying about discoloration. Seventh Generation sells this and I think there are other brands as well. I use this when washing all dish cloths, rags and other towels and have never had an issue with stinky dish rags. Another not very frugal but fun source of dish towels: I buy them as souvenirs when traveling. They are a nice reminder of former travels. I’ve kept some for 20 years, so I guess they earn their place in the drawer. We go through a lot of washcloths because we use them for wiping counters as well as well as using them as napkins. There is no good place to hang them to dry in our house, so I put a plastic basket with very open weave on top of the refrigerator. 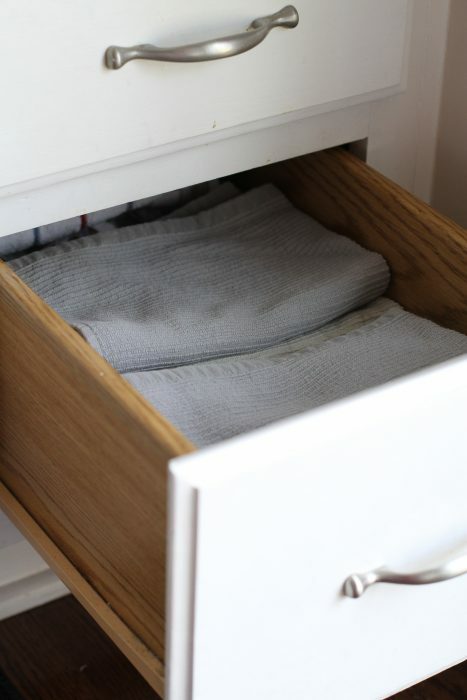 Since it’s always warm up there, the washcloths dry quickly and we don’t feel annoyed by using quite a few every day. I’ve never had them get an odor. We hardly use disposable paper (except for toiletpaper!) at our house and we keep those textiles sanitary in much the same way that you do. With two differences however: we do wash them hot, and we do not bleach them. We do not need to bleach for the simple reason that if you always wash towels, face cloths and kitchen textiles (but also bedlinens!) at 60 Celsius this is sufficiently hot to kill germs and dust mites. If you really want your linens to become more white, you can add a spoonful of bicarb of soda, or rinse the last cycles with special “blue” to re-supply the fibres with this colour, which will reflect light back as white. Finally, the most pleasant, cheap and definitely efficient way to whiten your fabrics is to line dry them in the sun. And I read that the UV also acts as a desinfectant! So on sunny days – bring out your laundry! Also- My cloth napkin and dish rag habit drives my mother nuts. She gets really annoyed at the fact that my dish cloths aren’t perfectly white or my cloth napkins (which she made for me 10 years ago out of linen we used at our wedding) are worn. She keeps buying me more and dropping them off at my house and then wondering why I keep my old ones! I say if they aren’t totally worn out, then I don’t have to replace them. I stopped buying paper towels years ago. We use cut up t-shirts instead. I can get three nice-sized “towels” from an adult t-shirt. I keep them all in a basket where Paper towels used to take up real estate. We go through a dozen a day at least because they aren’t as big or absorbent as the towels you describe. But we use them exactly as we did PaperTs in the past: dry hands, cover food in micro, bacon grease, etc. The best thing is I can throw them away with impunity after using them for any icky job because they are free and plentiful. I wash them in a large lingerie bag so they don’t get sucked into the washer and then dry them out of the bag or they end up in a big lump. We’ve used cloth napkins for at least 30 years. Our washer and dryer both have sanitize functions since they are steam models and we wash and dry our dish cloths, dish towels and older bath towels that way without dryer sheets. We have some new towels that are super soft and they require the gently cycle and low heat dry so those don’t get the sanitize process. We’ve never had an issue and the sanitize setting has been super helpful for those times when we DO forget to let them dry right away and they smell mildewy. It gets them perfectly clean! They aren’t soft after washing this way but we know they are sanitized. We also throw our kitchen sponges in with them and use them for years since they get so clean. All that being said we still use a lot of paper towels, mostly because they are what my husband reaches for about 90% of the time even though I’ve tried to get him to use a towel. I’ve pretty much given up that battle! I tried the boiling of washcloths after you posted about it. It worked great, and I’m thankful you shared it! I have recently learned that microfibres are being found in the systems of fish so I have moved away from them. It is fairly normal to use dish towels and cloths in Australia. I always line dry. Paper towels are used only for greasy or very nasty accidents. I must admit we have a drawer full of these items but they go through the normal wash.
Wow! You are way more sanitary than I am. Good work. I’ve been married for 47 years and I must admit, I wash my kitchen linens every couple of days. I try to use a different cloth or rag – one for dishes, one for counters etc, but that doesn’t always work out. I wash all my kitchen linens on the bedding cycle of the washing machine and I never, ever wash them with any thing else. (Pet peeve). When we were in a house they were mostly line dried. Now that we are in an apartment, then get hung on the drying rack. I avoid using the dryer as much as possible. I’ve never boiled my kitchen linens, but I love to iron them, so maybe that cooks the germs out. A really interesting post and I’ve enjoyed reading the comments. Thanks so much for posting this and I want to thank everyone for their comments as well. My sister keeps me supplied with knitted cotton dish rags. Love them because they dry out quickly. We use them at dinner time as napkins too. I don’t use many paper towels but I also lived with kids who believed you can’t use just one at once you need to have 6 or 7 ha ha ha. Me- can you use just one? Them -this is just one. Now that they have to buy their own I wonder if they still use that many! Ha! We do use towels and washcloths more than one day, but we are a mostly vegetarian houshold, and when I need to wash something that has touched raw meat, that washcloth goes right to the hamper. 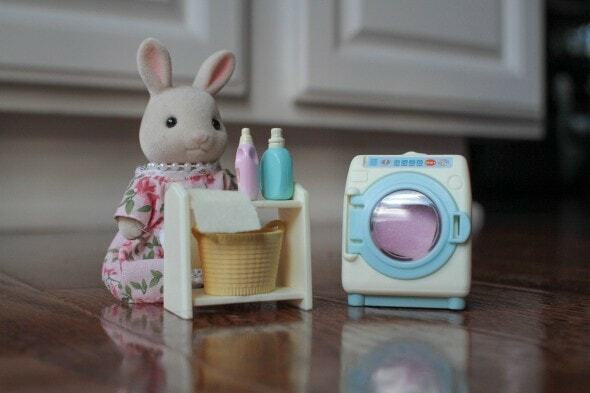 I almost always wash my kitchen laundry on cold. Everyone once in awhile (maybe twice a year) if I feel things are less than fresh, I run them through on hot. I don’t ever buy paper towels. The only time they are missed is when a palmetto bug (ie, huge roach) gets into our house and my husband is pressed into service to kill it (I personally cannot get my hand that close to them so I vacuum them up ). It’s never really crossed my mind to worry about germs after the towels are clean. I wash my rags separately from my kitchen towels, once they’re clean they’re good to go again! I bleach the heck out of my tea towels and dish rags — after reading the post and everyone’s comments, I think I need to try other options. And yeah, paper towels come in handy when the dog either pukes or is so excited to see us, she piddles on the floor. A few years ago, I scored 50 beautiful black and cream 100% linen napkins at Goodwill for about $6 — someone had apparently donated them after a wedding reception. Guess they didn’t need them….! I always use hot water to wash with even though it’s become acceptable not to. I also wash certain things separately to avoid any “contamination”. Bleach is best used in cool/cold water to maintain the germ killing properties. While hot water will allow the whitening properties to still work. This is what we where always told in the restaurants I worked in. Vinegar is an acid so be careful using it where it will come in prolonged contact with metal i.e. toilet tanks, metal parts of dishwashers and washing machines. It’s not an instant dissolving of metal surfaces but rather a slow weakening or corroding. I just use it and rinse well and th as the does the trick.